Still room for something sweet? Enjoy one of these places close to our midtown hotel to top off your day. Do not even think about leaving New York without trying one of the many desserts from Milk Bar. 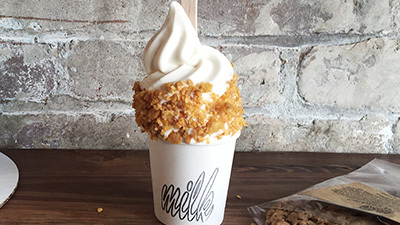 Grab a cereal milk soft serve or a compost cookie at their midtown location and plan to pair it with something savory from Milk Bar’s partner restaurant má pêche — you can’t go wrong with pork buns and fried chicken. Le Bernardin - "This midtown classic known for the finest fish is a promised homerun for lunch, pre theatre or classy dinner." Lincoln Ristorante - "This is my FAVORITE splurge for the most mind-blowingly delicious take on Italian food. Benno has a way of presenting the most clever, beautiful food, but with the most comforting, soulful notes of flavor every time." This cookie is unlike any other. 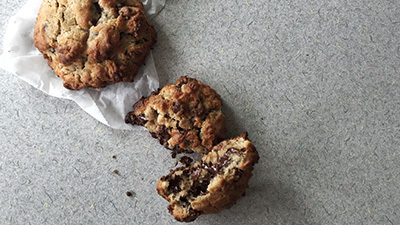 Always served warm with a perfectly crispy exterior and half-baked interior, these monster size cookies are the perfect reward after a day exploring the city. Chocolate chip walnut (pictured on the left) is a crowd favorite but you can’t go wrong with anything that comes out of this tiny kitchen.